We caught up with Barb Whitney, Executive Director for Lansing Art Gallery & Education Center, on her experience with Leadership Lansing after receiving the Resch Strategies Leadership Lansing Scholarship. RS: How was the Leadership Lansing scholarship beneficial to you and the gallery? 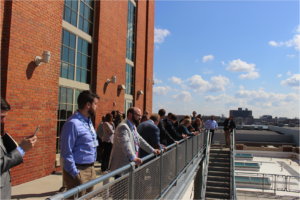 BW: Our Leadership Lansing group, Cohort #3, brought together key institutions, industry sectors and business leaders that are, in many ways, the fabric of the Greater Lansing region. My role at Lansing Art Gallery & Education Center includes oversight of programs, leadership and fund development. Thanks to the scholarship from Resch Strategies, Leadership Lansing enabled me to make authentic and inspired connections with other leaders in our community. RS: What did you learn from Leadership Lansing? BW: Leadership Lansing capitalized on our strengths, rather than our inadequacies as leaders. Facilitated learning with Susan Combs and Ross Woodstock was a joy, as they embody positivity in their practice as coaches. The support from Resch Strategies reinforced my commitment to serve the field and our region. Each session helped me in my work at Lansing Art Gallery & Education Center, and I have incorporated active listening and patience into my daily practice. I am more enriched with knowledge, motivated to serve the field, and inspired to do even more within our community. RS: What was your favorite part of Leadership Lansing? BW: Leadership Lansing has truly cultivated key leaders in our region! I really appreciated the camaraderie Cohort 3 enjoyed. Our collective experience helped us develop a network of colleagues locally who #lovelansing and support one another in efforts to build our community. Susan and Ross were authentic, engaging, and thoughtful in their presentation of a variety of opportunities, including field trips to key locations such as Lansing Community College, FRIB, and AF Group, as well as Lunch with a Leader sessions. RS: Would you encourage other Lansing nonprofits to apply or nominate someone else for the Leadership Lansing Scholarship? If so, why? BW: Absolutely! As a passionate arts administrator eager to advance the arts in greater Lansing, I so often publicly thanked Resch Strategies that Cohort 3 is considering how we can actively support the attendance of additional nonprofits and small businesses! We are now planning to meet collectively, think creatively, and brainstorm with the belief that we can make a continuing and long-lasting difference as leaders in our region.